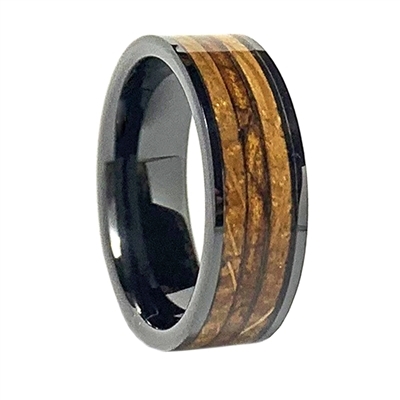 This elegant 8mm comfort fit Black High-Tech Ceramic band with Tobacco Leaf and a Genuine Wood From a Jack Daniels Whiskey Barrel Inlay is a bold choice for a special occasion. Tobacco Leaf and Wood is sealed to create a flawless smooth surface. High polish scratch resistant high-tech ceramic complements inlay for a one of a kind, natural look. Due to variations in tobacco leaf and wood texture, no two rings are the same. Its cool unconventional design allows you to enjoy it as a wedding or a right hand ring.